The Seoul Metropolitan Subway is the world's fourth largest commuter network, carrying 4 million passengers per day. The stations are bustling hives of activity, with food, toilet, and shopping venues readily available. Excruciatingly long transfers between different lines at the same station are not as convenient, designed as a mechanism to keep the general populace in top top shape. 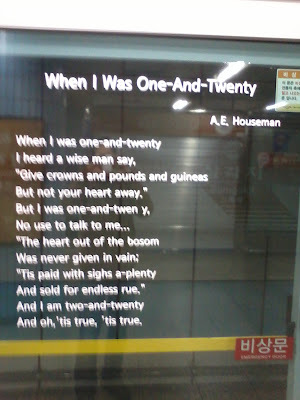 Vibrant ads and thoughtful poetry adorn the platform, and television screens feature entertaining lessons on how to behave at the station and on the train. The metro functions as a petri dish to examine modern day Korean culture, from etiquette to fashion. Once aboard, a first time rider will notice that there are reserved seats for old people and pregnant women which no able bodied person will sit in. These seats are even empty in a packed train during rush hour or late night when there are no oldsters or baby mamas in sight, as decorum must be maintained at all times in Korea. Looks of scorn are projected at those selfish enough to sit down on these without being infirm or impregnated. If the phone must be used to make a call, then the conversation is carried out in a hushed tone with one hand politely covering the mouth. Riding the Bombay locals was an exhilarating experience, but the primary excitement was in getting on and off a moving train. The ride itself was not very fun. The Seoul Metro is breathtaking while on board, particularly as spring turns to summer. Beautiful short skirted passengers sitting on the train carefully avoid reenacting Sharon Stone's famous scene from Fatal Attraction. They are absorbed in their own worlds, applying makeup or playing on their smart phones. Only an occasional shy glance is given to the Indo-Canadian Temptation. The women are not the only fashionable commuters in transit. Their stylish male counterparts all dress alike, the combination of their skinny hairless bodies and tight shorts and shirts giving them the appearance of ball boys at a tennis match. 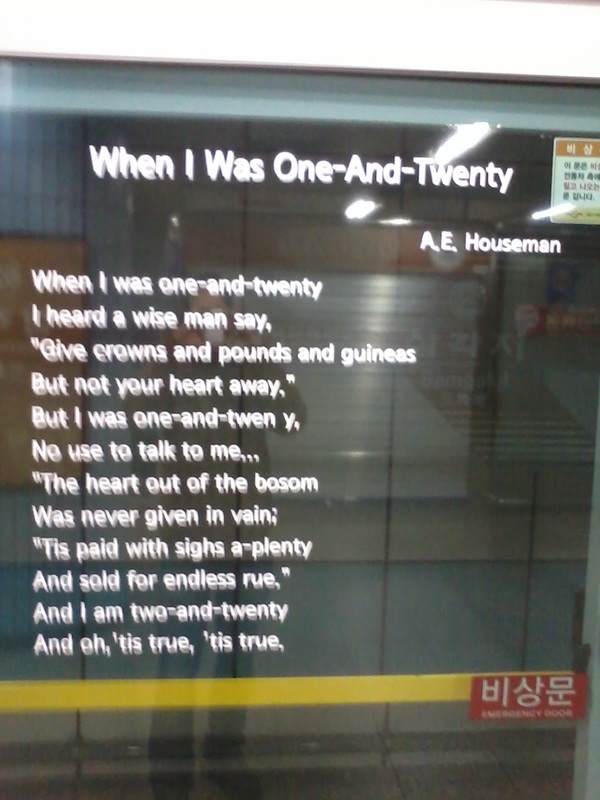 Many South Koreans are striving to improve their English skills, which are by and large nonexistent. Youth from wealthier families frequently go overseas to learn English and see a bit of the world at the same time. For those not blessed with the same opportunities, Korea is well stocked with white ESL teachers and bookstores providing learning materials.